This piece was developed within the framework of an exhibition project called Moot Points, curated by Kathryn Elkin at Transmission Gallery in Glasgow in 2008. 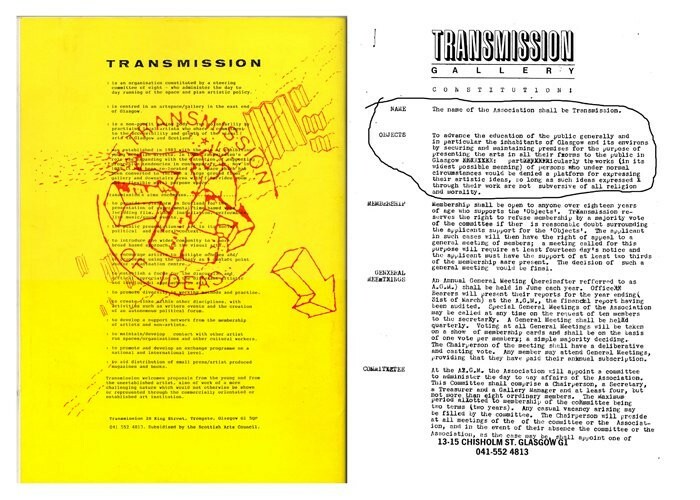 The Name Of This Association Shall Be Transmission was set up as a platform for the 400 Transmission members, invited guests, or anyone who came across the gallery, to propose a change to the "OBJECTIVES" of the gallery’s constitution. These proposed changes would then be considered, discussed or discharged by the members of the committee and hopefully ultimately make it to the constitution by way of the Annual General Meeting (AGM). With reference to examples of artists and art workers responding to their contemporary political situation, such as the The Art Workers Coalition formed in the US in 1969, the Artists’ Union formed in Britain in the 70s and The Artist’s Reserved Rights Transfer and Sale Agreement developed by Seth Siegelaub in 1971, we discussed how the "OBJECTIVES" of the gallery could be formulated in order to suit the needs and visions of those involved. What does it mean to work within the frame of a space like Transmission, and how can the limits of such a place be formulated and renegotiated? Is there a need to be specific in the description of "OBJECTIVES"? Do the current privatization of culture, both in Scotland and elsewhere, call for a rethinking around these issues today? While thinking in terms of a broader political scope is there a need to be specific in terms of ones own particular position? Are issues of class, ethnicity, gender, sexuality, age etc., as well as how these definitions intersect, important in order to maintain a complex discussion about culture and representation? The Name Of This Organisation Shall Be Transmission was later the impetus behind Subject in Process, a symposium on art and feminism, that was held at the Center for Contemporary Art CCA on September 5th 2009.